PARIS — "I'm not going to live forever," Renault CEO Carlos Ghosn told analysts and reporters last week at Renault's annual financial results presentation, "so people are wondering what will happen when I leave. It's a logical question." Only it turns out Ghosn's departure won't occur anytime soon, as has been widely expected. He does now have an heir apparent, but the company's board of directors nominated Ghosn, who turns 64 on March 9, to serve another four years as CEO. With that came the recommendation that he spend that time "taking decisive steps to make the [Renault-Nissan] alliance irreversible" and "strengthen the succession plan at the head of Group Renault." Ghosn has met nearly every challenge he faced in the last 20 years as he steered the alliance to become arguably the world's largest automaker, with more than 10.6 million vehicles sold in 2017. But his final task may be his toughest: Ensure the survival of the alliance after he is no longer around to lead it. To do that, Ghosn is handing over Renault's day-to-day control to Thierry Bollore, 54, who is to be promoted from chief competitive officer to COO. 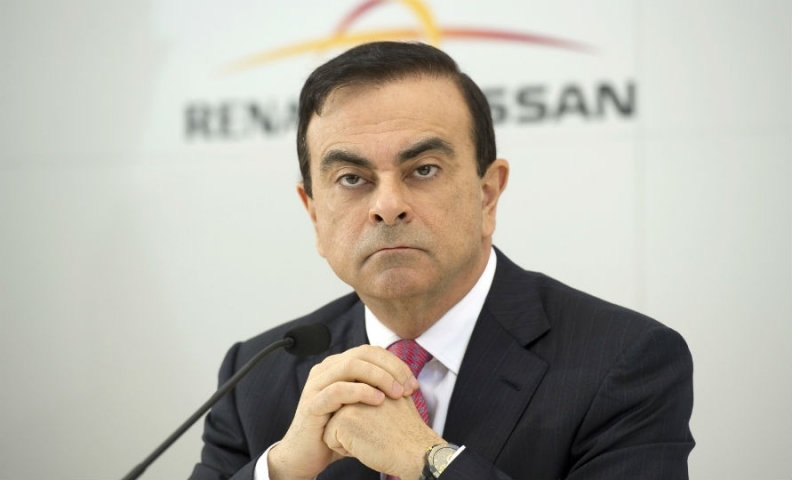 Ghosn also is taking a 30 percent pay cut from Renault, likely removing one sticking point with the French government, which holds a 15 percent stake in the automaker. Still, the fact that Ghosn is in charge of the alliance rarely has been in doubt. He served concurrently as CEO of Nissan and Renault for more than a decade before handing off Nissan leadership a year ago to Hiroto Saikawa. Yet he remains as chairman of the board at Nissan, at new alliance member Mitsubishi Motors Corp., at Renault and at the holding company headquartered in the Netherlands that oversees the alliance's joint activities and synergies. Now, Ghosn will have to figure out a way to ensure a "gentle" leadership transition, as he put it, and the survival of the alliance. By his own admission, it will not be easy. When it was suggested to him last week that delegation was not his strong point, Ghosn laughed and said, "Yes, I know, but I'm going to do my best. "You may have noticed that I'm not spending my time micromanaging Nissan," he added. "I'm learning to do a new job." Renault and Nissan remain separate companies, though they share many technologies and some cross-manufacturing. Common business units oversee operations in purchasing, advanced r&d, powertrains and commercial vans. However, many of their models remain on separate platforms, including the Renault Zoe and Nissan Leaf electric vehicles. Their brands run the gamut from budget Dacias to premium Infinitis. The next leader of Renault most likely will be the de facto leader of the alliance. Renault, although a significantly smaller company than Nissan (automotive revenues of €56.3 billion — $70 billion — vs. $105 billion), wields outsize influence. It holds a 43.4 percent stake in the Japanese automaker (which holds 15 percent of Renault), and starting with Ghosn and his initial team of French managers in 1999, has sent many top executives to Nissan for seasoning. "We have to think about what kind of organizations we need to ensure that the alliance survives the first generation of people who set it up," Ghosn said. He added that he needed the help of many stakeholders, including the French and Japanese governments. One possibility is a full — or fuller — merger of the three companies (Nissan owns a controlling 34 percent of Mitsubishi), but Ghosn has said that will not happen so long as the French government owns part of Renault. However, France has reduced its stake from 20 percent in recent months, and the government of Emmanuel Macron has said it wants to sell off more of its assets. "With Ghosn at Renault's helm, while serving as chairman of Renault, Nissan and Mitsubishi and head of the alliance, he is better positioned to facilitate full merger discussions between all parties involved: Renault, Nissan and the French government," Evercore ISI said in a note to investors last week. Bollore brings a sterling resume to his new post. He worked for Michelin, as did Ghosn, as well as Tier 1 supplier Faurecia in positions in China and Japan. However, Renault's previous two COOs departed in less-than-ideal circumstances: Patrick Pelata left in 2011 after three executives were falsely accused of industrial espionage, and Carlos Tavares, now CEO of PSA Group, stepped down two years later after publicly expressing his desire to run his own company. Bollore had shared No. 2 duties since 2013 with Chief Performance Officer Stefan Mueller, 57, who will leave Renault because of "health reasons," the company said. Now, the field has been cleared for Bollore to show Renault's board — and the French government — what he can do. He is inheriting a growing, profitable company, but Ghosn made it plain that he will be watching closely for any signs of slippage. "I am certainly starting this off with a lot of goodwill," he said. "The team that is in charge has to give us the performance that we need." Ghosn portrayed the management changes at Renault as his decision. He said he told the board he would continue in his post if he could appoint a COO. "Renault is a rugged and robust company today. This is not a defensive position," he said. "I said yes based on a road map that suits me and that I think is reasonable."